The Centre for Arab Genomic Studies worked since its conception at establishing an important balance between its scientific research objectives and the values of the Arab and Islamic environment to which it belongs. 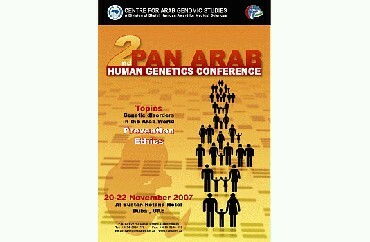 The 2nd Pan Arab Human Genetics Conference, which convened in 20-22 November 2007 in Dubai, crowns this vision by the organization of a Public Forum on 'The Ethical Perspectives of Human Genetic Applications in the Arab World' on Tuesday 20 November 2007 bringing together scientists, legal advisors, and religious scholars to discuss issues related to the advancement of genetic sciences in accordance with the established values in the region and to utilize them for the benefit of the nations without losing sight of their legitimate and legal controls. Since the Arab world is capable to participate in genome research, there is an urgent need for the formation of national committees where their mission is to set ethics for scientific research in each of the Arab countries, and to coordinate between them and the committees in other states. The Conferees have noted that the genome research is of emerging scientific matters and many of the Arab countries laws exclude articles that provide for ethics and controls that must be met in genome research. It is hoped that researchers propose controls, and it is legislatively necessary to activate these proposals by enacting laws and regulations governing such researches. As the genome projects are characterized being a research work that depends on the international participation to ensure the exchange of experience, information and genetic samples, therefore it is a must to open the legislation door in this developed area to facilitate the participation of Arab scientists in such research freely and positively. The Conferees also recommended the specialist scientists to develop legislative controls for the genome research where balancing the interests and harm and promoting the scientific research must be taken into account for this will not be at the account of the religion principles or the privacy of the community and individual. And to spread awareness and culture in this area, the Conferees have recommended the need to develop educational plans addressed to individuals and groups. The Conferees have agreed on the importance of genetic testing as an integral part of the health system in the Arab countries, and it is been proved from the experiences of many nations the importance of genetic testing prior to completion of the marriage, while the Conferees thanked the states that ensured their need for genetic testing, and they also recommend the legislative authorities in the rest of the states to follow the latter states' example. And to achieve this, the Conferees have recommended to working on the study of legal and legitimate controls for the genetic testing before marriage which is a fundamental step to demand the application of these tests in the Arab countries. They also recommended the formation of a joint committee of forensic scientists, doctors and specialists in genetics to develop a list of sexual and genetic disorders that must be covered by medical examinations assessed before the marriage. Due to the dramatic spread of genetic disorders in the Arab world, the Conferees recommended the listing of the genetic counseling and fetal testing within the health system of the Arab countries, while taking into account the legitimate and legal controls and information confidentiality. The Conferees recognize the progress of the medicine in the modern era, which led to the discovery of new cases of congenital and genetic disorders in embryos other than the ones considered by Islamic jurisprudence academies, and many of those cases cause the birth of children suffering from chronic diseases and therefore suffered by their families and society; so they ask the scientists specialized in forensic sciences to be diligent in defining new cases that because of them abortion can be disclosed. Doctors also call specialists to present such cases and researches to the Islamic jurisprudence academies to issue judgments after forming extensive researches and discussions. And to raise awareness of limiting the spreading of genetic disorders, the Conferees recommended the dissemination of genetic culture between individuals and groups in the Arab world. The Arab Council of the Center welcomed the noble deed of His Highness Sheikh Hamdan Bin Rashid Al Maktoum, Deputy Ruler of Dubai, Minister of Finance and Industry, by granting a special Award for genetics science presented through the Pan Arab Human Genetics Conference, appreciating his attention in strengthening the genetic research in the Arab world for the advancement of health care in the region. The Conferees also recommended to send a telegram of thanks and appreciation to His Highness Sheikh Khalifa Bin Zayed Al Nahyan, President of the State (may God preserve him), and to His Highness Sheikh Mohammed Bin Rashid Al Maktoum, Vice-Chairman of the State, President of the Council of Ministers and Ruler of Dubai (may God preserve him), for the hospitality and the organization of the Conference in the land of the United Arab Emirates. They recommended to send special thanks and gratitude to His Highness Sheikh Hamdan Bin Rashid Al Maktoum, Deputy Ruler of Dubai, Minister of Finance and Industry, the sponsor of the Conference (may God preserve him), for his generous support of medical sciences in general, and genetics sciences in particular, and also for his devotion and constant follow-up to everything that would serve that area. The participants in the Conference also thanked His Excellency Dr. Hamad bin Al Sheikh Ahmed Al Shaibani, Director General of the Islamic Affairs Department and Charitable Activities in Dubai for the effective cooperation done by the Department to support all the proceedings of the Conference. Many thanks goes to the Sheikh Hamdan bin Rashid Award for Medical Sciences represented by its Board of Trustees and its Chairman His Excellency Mr. Humaid Al Quttami, Minister of Health, the General Secretariat of the Award, by the Secretary Professor Najib Al Khaja, and his staff, and particularly the Center for Arab Genomic Studies for the good preparation, organization and reception. And thanks to the honorable scientists who contributed in sustaining the Conference by their valuable researches in the scientific, legal and legitimate fields and many wishes for progress and success.